As Amanda and Jocelyn Koehler have noted, there’s been a lot of interest recently in retelling the story of “The Twelve Dancing Princesses.” It’s one of my two or three favorite fairy tales (in company with “The Six Swans” and “Seven Simons”). In a fairy tale, I like a hero (or heroine) who succeeds by their wits, definite elements of magic, and at least some come-uppance for the antihero of the piece, if one is present. 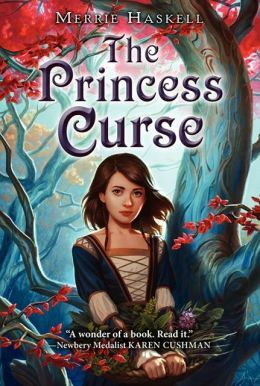 I got pointed to The Princess Curse by Merrie Haskell thanks to a mention made by Jim C. Hines, as he was previewing several things that were due to come out in February. I love his princess series a lot (although I think it’s not appropriate for most of the kids this site is targeted at), so on his recommendation I tracked down The Princess Curse. I’ll assume you know the general outline of the story of the dancing princesses, so I’ll recap the primary differences here: The retellings rarely explore the origin of the curse, but in The Princess Curse, the question of why the shoes wear out is intimately tied with the origin of the princesses’ curse. In addition, Reveka—the character who investigates and discovers the answers—is a girl, not a boy. There’s also a tie in the origin of the curse to a number of mythological & folktale concepts that I’ll hit below in a moment. A few thematic points follow, with massive spoilers for the second half. One thing in the book that did bother me is the way that Reveka’s family relationships are portrayed. Although most of what I’ll be referring to happens before the book starts, Reveka was originally housed at a nunnery of some sort, where the mother superior automatically believed that she was lying about anything. Although her father reaches an agreement with Reveka that he will believe her unless he has proof otherwise, that kind of deep-seated mistrust bothers me because it feels like it’s not really necessary to the plot except to keep Reveka from discussing what’s happening with most of the people around here. In the second half of the book, there’s one character who claims to be a witch in the sense of “pre-Christian religion.” Although this doesn’t bother me, I’ve had just enough acquaintance with people who would object to it that I feel compelled to mention it. Most of the second act has massive overtones of the myth of Persephone and the story of the Fisher King. The origin of the curse is explained as being the working of a demon/dragon (I’m still not quite clear even after the glossary which way the word should get translated) prince needing to find a wife in order to nurse the health of the land. The princesses are given a choice between marrying him or dancing with him. Every night, they each choose to dance rather than marry him. If they can hold out long enough (seven years, if I remember correctly), then the curse will be lifted. Reveka ends up in the ballroom when other people from the world above manage to find the underground palace, and she volunteers to be the one to marry the dragon. It takes a long time for her to understand all the ramifications of what she’s done, and she spends some of her time doing that trying to fix the problems that the princesses caused in the world above. It’s not explicitly stated, but she ends up like Persephone. The dragon prince’s lack of marriage is tied to the health of his kingdom, which is tied to the health of the kingdom above, and he ends up rather like the Fisher King. I enjoyed reading the book, since it hits most of the notes I mentioned above in what I like in fairy tales. It keeps the chapters short enough to apply to the age group it’s targeting. As an ex-bookstore employee, my take is that this is intended for a “middle grade” (translate: upper elementary and/or middle school) audience. My 7-year-old son, referred to online as The Grasshopper, is a bit of a precocious reader, regularly tackling things into this age bracket. Although he’s inheriting my love of fantasy, he isn’t likely to enjoy this book as much as I did. I think that’s because he’s on a bit of a “guy things” kick at the moment—he’s been devouring the Big Nate & Wimpy Kid books as he can get his hands on them, but has also been reading Percy Jackson & Star Wars: the Clone Wars tie-in books.